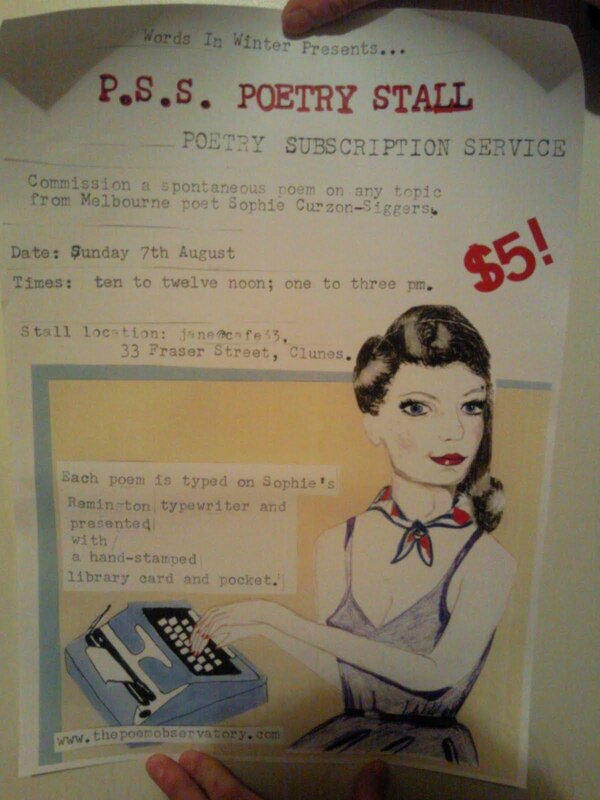 Blog and website of Melbourne poet Sophie Curzon-Siggers. Saint Gretchen of the Underground saint cards, front & back. 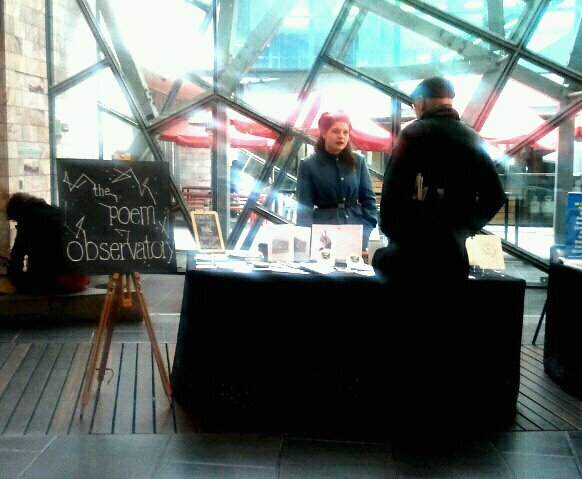 The Poem Observatory at Page Parlour, Fed Square Atrium, 3rd June 2012. The Poem Observatory on the MX cover! I'm on the front cover of today's MX (Melbourne's newspaper for commuters, with a daily readership of 312,000), as publicity for the Emerging Writers Festival. Two newspaper front covers in two weeks! ...but inside too, with a named mention! Poems featured in the carriages on the Paris Metro. The Paris store that Adelaide & I almost bought out - 1960s briefcases, a stack of old, unused notebooks and school rubber stamps. Stained glass windows by Chagall, at the Reims Cathedral, depicting the Jeanne D'Arc story as following on from other great biblical events and figures. In front of the cathedral, the Jeanne D'Arc statue. The Advocate's Renee Robinson took a photo of me at last weekend's Back to Booktown in Clunes, the annual book fair that draws 15,000 visitors. Amidst the book-buying frenzy, my poetry stall and I staked out a small corner. Unable to copy the photo or link directly, but it can be found in The Advocate's online gallery of the weekend. Words in Winter, a literary festival held in the Victorian Goldfields, invited me and my poetry stall up for the weekend just gone. My partner and I were put up by WIW at Duke's B 'n B, which was the most wonderful accommodation either of us have ever enjoyed - hardwood floors, sumptuous breakfasts and a cosy but well-curated environment. The P.S.S. 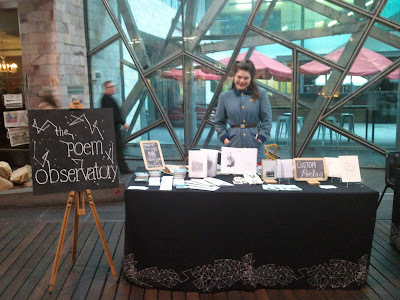 Poetry Stall was received with real enthusiasm and a steady line of requests on the Sunday. 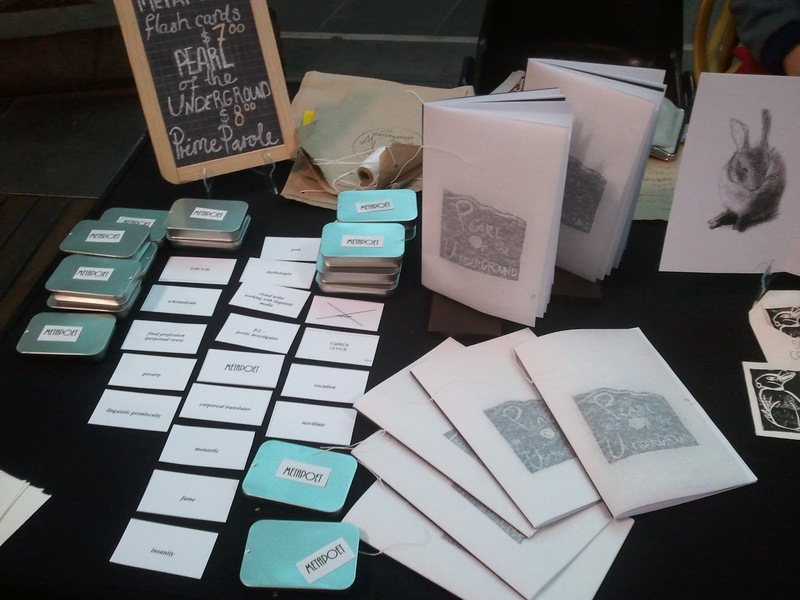 The requests were varied and while many were made with the intention of gifting the resulting poem to a specific person, they were still sufficiently open to interpretation. Jane @33, the cafe` (a Clunes establishment and hub) that hosted the stall was an enlivening venue and Jane herself is a lovely person. 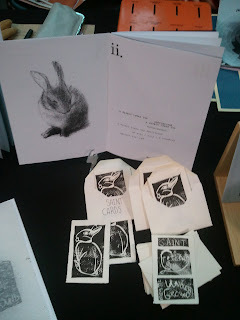 The space is lined with intriguing ephemera, and the food and drinks (over a dinner and a lunch, plus hydration!) were extremely tasty. The definite highlights were a chocolate and chilli tart, and the chimichangas. I'm now the 'Notorious Poet' - Take a look at my poem in the latest issue (#23) of the Get Notorious Magazine, run by some of the people behind 1000 Pound Bend. They've asked me to contribute a poem each issue that includes the word 'notorious'. 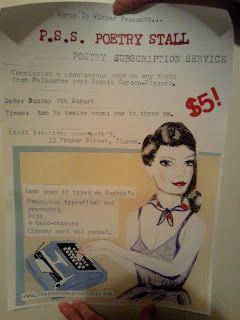 Next Sunday will be my poetry performance debut, at an event organised by Australian Poetry. 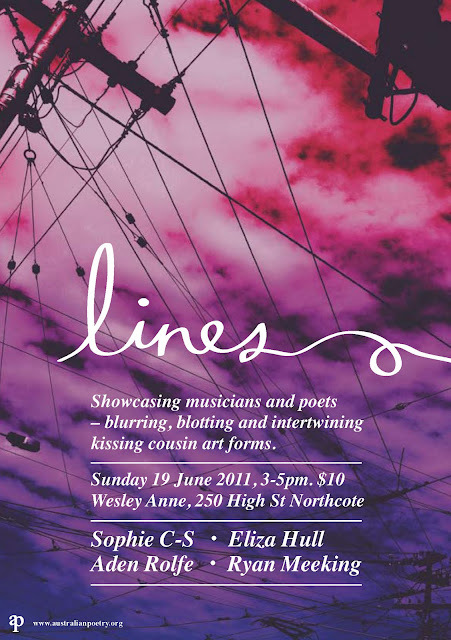 Two poets, two musicians - four slightly overlapping performances of 'kissing cousin art forms'.